Pliny the Elder was a Roman admiral, a historian, a naturalist and a lover of good food. While Pliny the Elder was in India, he learned a secret of bee keeping that he brought back with him to test. In 78 Ad, the vineyards of Pompeii produced grapes that were to make the best wine in all of Roman history. He combined Pompeian wine, honey and precious herbs from field where a 1000 Spartans had been slain. By doing this, he created a marinade so powerful, so delicious that the mere scent of it wetted a hunger of Herculean proportions to anyone who passed by. The marinade perfected, Pliny needed a heat great enough to sear it into the meat, a heat as powerful as the marinade itself. When that fateful day came and smoke from the great mountain was on the horizon. Pliny the Elder knew what to do. Sailing his fleet of ships south to Pompeii to save the citizens of the doomed city. He arrived with a dual purpose. Most historians think of Pliny the Elder as an organizer of the evacuation that saved many, but secretly he didn’t want anyone to know of his latest culinary discovery, until he had tested his theory of heat. All naturalists are in tune with nature and Pliny knew the best hot spot was to roast his pork over lava. That was the missing element from his culinary perfection. 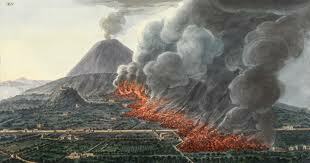 During the eruption of Vesuvius, when the lava was covering Pompeii. Pliny had his opportunity to use the best coals around. Pliny the Elder died August 79 AD during the eruption of Mt. Vesuvius while perfecting his recipe. His secret lost forever until now. 1-bottle red wine- chuck is best for this recipe, half of the bottle for you. The other for the pork.